Replacement:DEV-09716. We don't make this board anymore but the version that includes right angle headers is still going strong. This page is for reference only. The pins labeled BLK and GRN correspond to the colored wires on the FTDI cable. The black wire on the FTDI cable is GND, green is DTR. 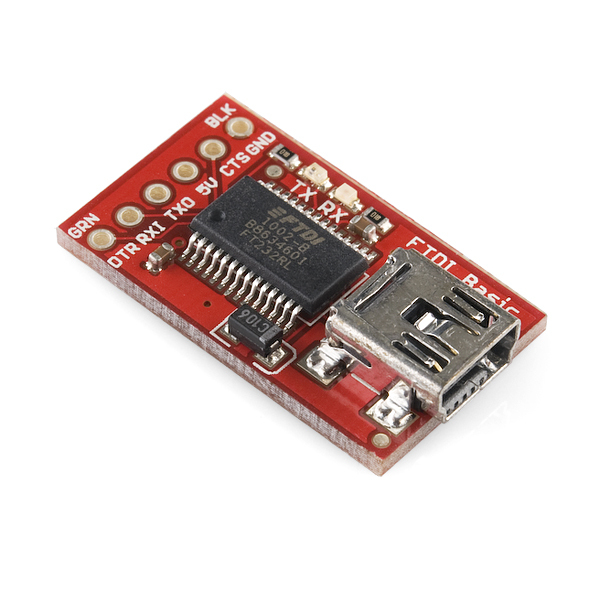 Use these BLK and GRN pins to align the FTDI basic board with your Arduino target. 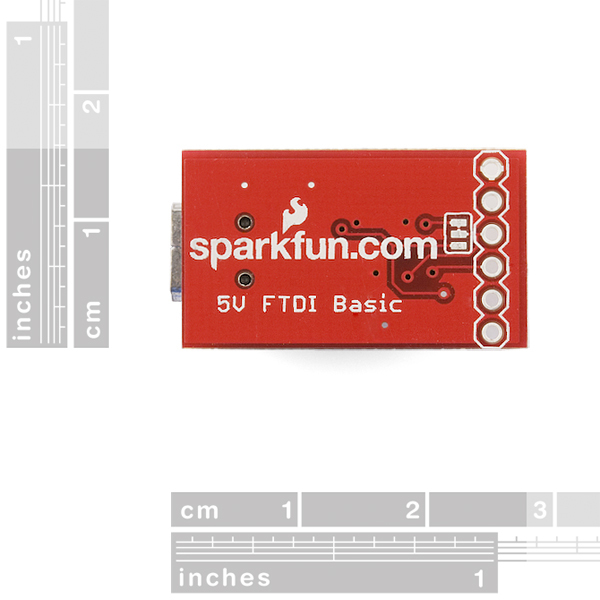 There are pros and cons to the FTDI Cable vs the FTDI Basic. 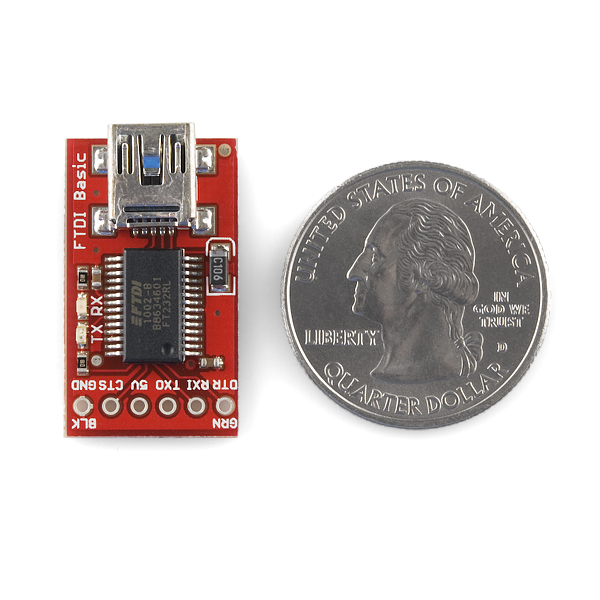 This board has TX and RX LEDs that allow you to actually see serial traffic on the LEDs to verify if the board is working, but this board requires a miniB cable. The FTDI Cable is well protected against the elements, but is large and cannot be embedded into a project as easily. 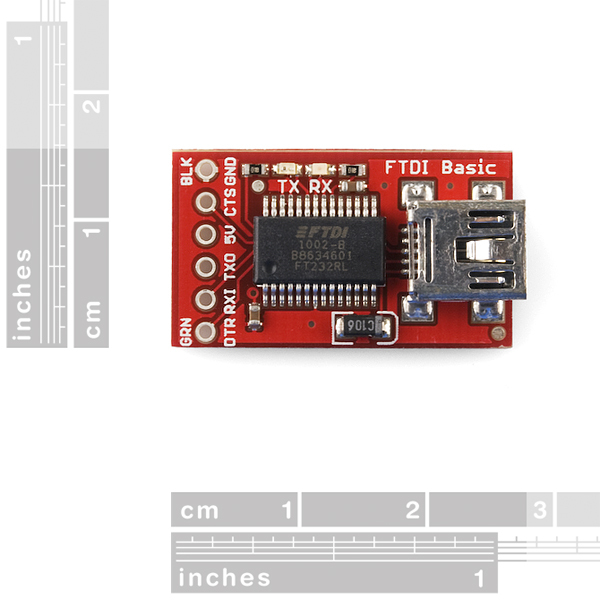 The FTDI Basic uses DTR to cause a hardware reset where the FTDI cable uses the RTS signal. This FTDI module seems to run great in Ubuntu 11.04 (using 'cat' and 'echo' with tx/rx bridged) but when I run minicom, the module stops working until my computer is rebooted. So the lesson for now is to not use minicom to test the loopback. Anyone else encounter this problem? Want to hookup to Ardiuno Mini 04 - +5,G,Tx,Rx easy, but how to connect/if to connect to reset for programming? Also, do I cut the jumper in back? To get the auto-reset to work, can the DTR pin be directly connected to the reset pin of the atmega328, or does it need a capacitor connected in series before the reset pin as shown in the Arduino Breadboard Tutorial? Is that a mini or micro USB connector? It is a mini USB connector. Which trace do I cut to switch between 3.3 and 5v? Also I have the one that has extra space at the end for more connections to the pins if you want. You could probably use some copper tape to bridge it if you don't have any soldering equipment. Turn the board over and look at the 3 little copper patches close to the line of holes for the signals. There is a little trace between two of them. Cut this, scrape it a little to remove the trace between the two pads and then just use a solder glob or something to bridge the other pad to the middle. Can SparkFun make a beauty like this? I have had no success locating them on their own. Seems perfect! A person could make it longer and include the Vcc, GND, XTAL and caps. Take a look at this blog post.